Today on the Encounter Table we continue following the adventures of Aribessa and Patris in Tyranny of the Stars. The Between the Lines section after the story includes rules for a new model of clockwork construct designed for simple, manual labor with a skillful twist. This option presents a low-cost and low-power construct for PCs interested in having clockwork companions at lower levels of play. 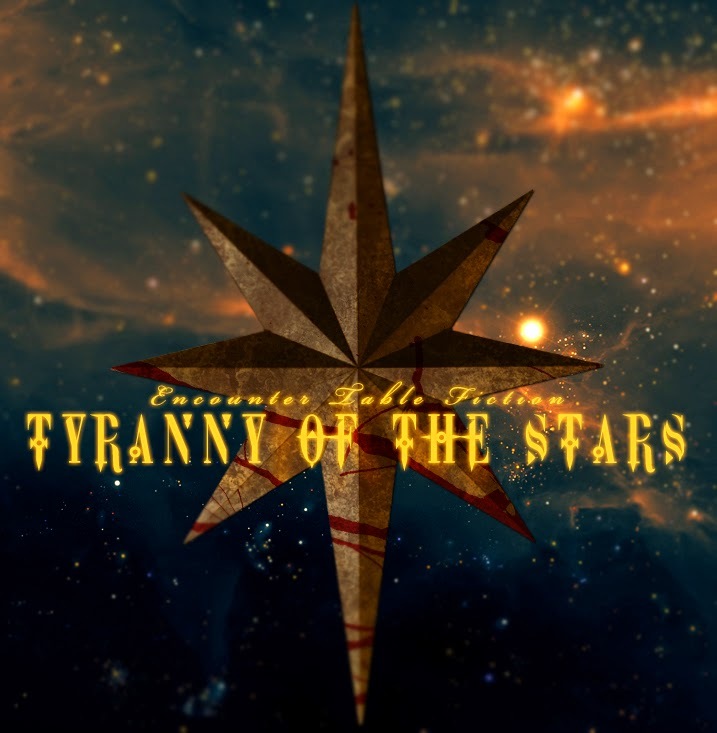 Let us know what you think of Tyranny of the Stars in the comments section! Alkenstar City is an anomaly in almost every respect. It's a thriving metropolis in a lifeless wasteland, a technologically advanced civilization in a world of magic, a Duchy nearly in name only that shares its tenuous ties to the northern kingdom of Nex. From afar, the anomalous city is appears as a bristling series of stone and metal monoliths that reach upward from a shroud of perpetual smog. The afternoon sunlight bathes that shifting sea of smoke and steam an otherworldly color, like gold turned to vapor and poured out across a broken stone floor. As the airship Stormfront approaches Alkenstar, the river that bisects the city becomes a colorful spectacle as it tumbles over the edge of the Hellfallen Cliffs in a waterfall of shimmering, rainbow hues. Some of that color a play of the light, some of it is chemical pollution in the water. The city's high walls contain the smog like fog pooling in a temperate lowland on a cool autumn night. Sky towers—massive stone buildings hundreds of feet high—jut up from the concealed city below, giving its residents a clear view of the sky and fresh air. As the airship crosses over the crenelated battlements of the city wall, its propellers stir up the smog in whirling eddies. Soon, the vessel plunges head-long into the gray, bathing the airship in a haze of ashen smoke and greasy steam. When the Stormfront breaks below the smog level, the city beyond is cast earthen shades of brown and gray. The ground levels of the sky-clawing towers look like castles all their own, and the streets practically glitter with the golden light of gas lanterns. A vast, earthen plaza greets the airship on its descent, where tall towers of metal and wood scaffolding serve as harbor to other airships. The Stormfront's propellers slow down and anchors are thrown over the sides of the ship down to a crew of yard workers. They scramble hastily, tethering the vessel off to enormous iron pitons driven into the ground. Around the same time, the Stormfront lets out a belch of steam and smoke from one of its rear engines, followed by a hiss of pressured gas as the propeller stops entirely. Mechanical failures like this are common on airships, and the noisy fanfare draws little attention from below. The Stormfront never truly lands. It merely comes flush with one of the docking towers some twenty feet off the ground. A railed gangplank is hauled out for passengers to cross and they are escorted off by crew and to a cramped, iron-caged lift. "I'm sorry," Aribessa tries to explain over the noise of the lift doors clattering shut, pressed shoulder-to-shoulder with the other passengers. Her words don't entirely fall on deaf ears, but with his head gently resting against the cage, Patris is choosing not to acknowledge her. He feels his slouched posture and avoidant stare announces that fact rather clearly. Yet, still, she tries. "Look, I can help you find another job," is a genuine promise. "Besides, being a crewman on an airship can't be all that great, right? I mean, apart from the traveling... and—and the sightseeing. It probably paid poorly, yeah? Yeah." She nods, repeatedly, with a frustratingly optimistic smile spread ear to ear. Patris slides a flat look over to her, sighs, then looks down through the grated floor at the slowly approaching ground. "Come on," Aribessa pleads, laying a hand on his shoulder, "I can set you up with a room in Skyside while we get this all sorted out. Maybe I can talk to the Captain and—"
"I don't want you to talk to the Captain," is the first thing Patris has said in the last couple of hours. He looks back to Aribessa, then away, then tries his best not to be cross with her. While his latest infraction with the Captain was the proverbial 'last straw,' Patris realizes that he'd been plucking from that particular bale of hay for a long time now. He'd had this coming. Admitting that fact is considerably harder than recognizing it, and doing either while sandwiched between a dozen strangers is neither easy, nor comfortable. To her credit, Aribessa has tempered her excitement as of their arrival in the city. She keeps herself from interjecting between Patris' pauses, prolonged as she feels they are. "I was getting tired of that job anyway," isn't entirely a lie, but Patris' delivery isn't entirely convincing either. Regardless, Aribessa lets it go for now. "Then, a room at least? I won't have you sleeping on the streets." The elevator lands with a loud clang as she tries that offer again. Patris begrudgingly rolls his shoulders and nods. He'd have thrown his hands into the air in defeat as well, but they're effectively pinned to his sides. Aribessa takes his silence as acquiescence. At street level Alkenstar is a labyrinth of cobblestone roads, towering buildings, and flickering gas-lamps under a constant shroud of smog belched out by the city's great foundries and forges. In this city of industry the struggle to live takes on an urgency not found elsewhere in the world, made manifest in the hustle and bustle of its inhabitants. Sooty workers just let out from their jobs at the foundries for the day pack the streets, while clockwork auto carriages click and whir through the crowd at precarious speeds. Patris has seen this all before, and with his scarf tugged up over his mouth to keep out the worst of the pollution he watches Aribessa's wide-eyed demeanor contrast his own reserved one. Wheeling about, marveling at this lantern or that clockwork automaton, she revels in the artifice that residents of the city pass by without second glance. "Just look at this, Patris!" She exclaims for the fifth time, taking him by one arm and hauling him over to a grimy storefront window where the animatronic bust of a gentleman in a tophat wobbles his head left and right, watching the crowd. Forthwright Factories Clocks and Automata the sign above the window proclaims. Finest Machinery in the Wasteland and Beyond. A collection of timepieces are displayed in the window in decorative cases, all surrounding the torso of a clockwork automaton. When Aribessa approaches the window, it reaches up with one clamp-shaped hand and pulls off its brass tophat, giving her a tip of its head and croaking a programmed, "Good day, sir or madam!" Its voice a hollow, tinny thing. A placard below the bust promises "the finest service automaton in all the Wastes, the Forthwright Factories Gentleman." "Look at the articulation on the jaw piece, and the casting of the ceramic for his face-plate! The golemworks in Magnimar would die to have something of this quality!" While Patris listens to Aribessa, his eyes are focused more on his own dirty reflection in the window. There is a certain detachment that has always accompanied moments of his own failures (perceived or otherwise), even if he's come to accept them. Today isn't proving to be much different, and Patris is finding his emotions as muted as his reflection. He only reacts when Aribessa heads for the door to the shop, giving her arm a gentle tug back. "Lets just..." he hesitates to correct her as she looks back at him with the expression of a pup on a leash that just wants to smell what's right over there. He sighs, brows raised and shoulders slacked. "Can we settle in first? I've been on my feet all day and—"
An embarrassment of words spills from Aribessa in response. "Oh! Oh of course! Oh, I'm—Yes! I'm sorry." Sheepishly backing away from the shop's door, she turns on her heels and grimaces. "I'm sorry I've just—this city is so fantastic. I've never seen anything like it before." Dismissively waving a hand, Patris steps aside and falls in line to walk at Aribessa's side as the two continue down the street. "Where do, ah, curious people like yourself come from?" Patris asks, so as to avoid prolonged stays in such places. "I'm from Magnimar, up in Varisia across the Inner Sea." Aribessa answers after a moment of hesitation. "Born and raised there. My father's a craftsman at the Golemworks, I did some understudy work with him before joining the Pathfinder Society." The last bit elicits a quirk of one of Patris' brows. "Surprised?" Aribessa quips in response, leading both she and Patris aside to make room for a rifleman on horseback trotting down the street. "A little? The Pathfinders I'd met working on the Stormfront were less..." he shakes his head, "they were a little more—"
"Sure. That's a good word for it." Patris agrees with an affable smirk. "You're new at the job, then?" "You could say that." Aribessa sidesteps around the topic. "I'm not here on any official business, I've just always wanted to see Alkenstar. My father passed away last year and left me quite a bit of inheritance, so I'm using some of it to travel and—I guess figure out who I am?" Finding some commonality in that, Patris lets out a snort of a laugh and shakes his head. "Fine place to go looking," he remarks, brushing one hand along an iron lamp post as they pass, sweeping off a layer of ashen grime. "I have an idea," Patris says more to himself at first, rubbing the grit of the ash between forefinger and thumb. "I know the city pretty well. I wasn't raised here," Aribessa nearly interjects with a question here, but stops herself short of it. "But I've been enough times to know the ropes. I can show you around, you can pay for my expenses, and it'll almost be like you didn't cost me my job." Aribessa squints in response to that last part, but lets it pass without comment. "Alright," is delivered with a more level tone; thoughtful and succinct. "You've got yourself a deal." Then, just as Patris is warming to the idea she adds, "Just remember, this was your idea." A lanky humanoid with a made from whirring gears and hammered with a head shaped like a stovepipe iron stands at attention. Punchcard Skills (Ex) A clockwork laborer is designed with a punchcard slot in its back adjacent to its winding mechanism. A clockwork punchcard may be inserted or ejected from the laborer by the bearer of the clockwork's winding key as a standard action. A clockwork laborer with an inserted clockwork punchcard gains the associated skill ranks and may be instructed to use the skill as though trained. A clockwork laborer may only have one punchcard inserted at a time and the punchcard remains active until removed. The default clockwork laborer is considered to have a Craft (weaponsmithing) clockwork punchcard inserted, with 1 skill rank. The creator of a clockwork laborer must start with crafted clockwork pieces worth 300 gp. This rectangular brass card is engraved with geometric patterns and punched with tiny rectangular holes down its length. A clockwork punchcard is designed for use in a clockwork laborer. The card contains a number of ranks in a single skill as determined by its creator. When inserted into a clockwork laborer, a clockwork punchcard grants the construct its skill ranks which the clockwork laborer may use as if trained with its own ability modifiers. No matter how many ranks a given clockwork punchcard can grant, a clockwork laborer may only benefit from a number of skill ranks equal to its hit dice. A clockwork punchcard with an Intelligence-based skill is of no use to clockwork laborers as they have no Intelligence score and cannot use the skills. A clockwork laborer who gains an Intelligence score can benefit from Intelligence-based punch cards. Craft Wondrous Item, fox's cunning, Skill Creator must have skill ranks equal to desired skill and ranks for card; Cost 1,000 gp per skill rank.